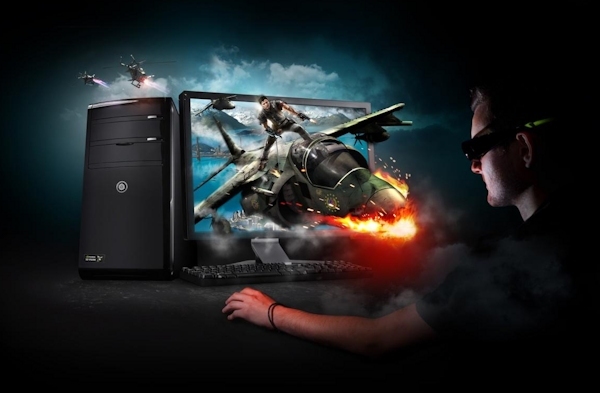 Can 3D save the PC industry? Yes, it can. I really think it can. So here’s the deal. Personal computer sales are going down the toilet. According to IDC, total sales are down 14 percent for the first quarter of this year compared to last year. There were more than 88 million computers sold in the first quarter of last year, and just over 76 million this year. That’s twice as steep a drop as IDC originally projected, and the biggest drop ever, despite an improving economy, a new operating system and some feature improvements. IDC blames the drop on two factors – the rise of mobile devices such as tablets and smartphones, and the abysmal failure that is Windows 8. They didn’t use the word “abysmal” however. That’s just me. I’ve reviewed Windows 8, and didn’t like it much. In fact, Windows 8 is seeing a worse adoption rate than Vista. But there’s a bigger issue at stake. Consider the things most people use computers for. Light wordprocessing. Tracking the family budget with a spreadsheet. Fixing the contrast on photos. Surfing the Web. Watching funny cat videos. I don’t know about you, but I bought a laptop for the living room three years back that was the cheapest in the store. That $200 laptop could do all of those things, and still does, though we’re having to reboot it more often than before. We’re not seeing any delays when it comes to surfing the web or watching videos, so an upgrade wouldn’t significantly improve our lives. I’m not going to get rid of the PC altogether. I prefer typing on a full-size keyboard, and I like to work sitting at a desk, looking at two giant monitors. But more and more often, I turn to mobile devices for things I used to do on my computer. Reading research reports and other background articles. Keeping up with industry news. Managing my calendar. Checking my email. There is no reason for me to upgrade my computer. I can’t fit any more screens on my desk — and wouldn’t be able to use them, anyway if I did. If I had a wall-sized screen, I’d have to sit far enough away to see the whole thing, which would make the type too small to see unless I made it really big, which kills the whole point of having more real estate, anyway. In the early days of computers, I used to type too fast, and the computer couldn’t keep up. That never happens anymore. In the early days of computers, our screens were low-resolution and everything looked pixellated. But the latest high-resolution screens — like Apple’s “Retina” displays — are photo quality. Adding more pixels wouldn’t make any difference. There’s no reason for me to upgrade. There’s no reason for my company to upgrade. If a computer breaks, we’ll replace it — but we’d prefer to replace it with a Windows 7 machine, which is more than good enough for our needs. And as we start carrying around more mobile devices and fewer laptops, the computers break less often and we need to replace fewer of them. Now consider a hypothetical future where immersive 3D is the norm. We work in virtual offices where we can interact with our bosses, our colleagues, and our customers. That requires lots of image processing. We either have large screens, or images projected onto walls, or high-resolution virtual headsets. The screen on which we do our actual work becomes just a small part of a large virtual environment. Imagine Retina display-quality resolution, not in an area the size of a tablet, but in every direction you look. Updated fast enough that you don’t notice any lag. You feel that you are actually there, in your company office. You’re saving hours of commuting time a week — plus all that gas — and you get to meet your kids at the bus when they come home from school. At which point, the kids will want their own virtual reality. So they can go to virtual Paris to practice their French. To a virtual rain forest to do their science homework. To a recreation of the Battle of Gettysburg for history class. But you’re a mean parent, so you send them outside to play until dinner. They can go online later, when you’re done with work. And they probably won’t be doing homework, but playing with their virtual pet dragons in some virtual fairy tale world. Anyway, all this will take massive amounts of processing power, and some kind of fixed location. Augmented reality — where, say, a person’s name pops up in your field of vision when you meet them for the first time — works well in a mobile setting. It doesn’t replace the world around you, just adds little snippets of information to it. Virtual reality takes you away, so you don’t want to be interrupted while using it. Even if the technology is small, like a virtual reality headset, you probably don’t want to be using it in a public setting. Someone can spill soup all over you because you didn’t move out of the way. I you have to talk to people in the virtual environment, you’ll just be annoying everyone around you in the real one. And when you wave your hands around to rearrange your PowerPoint slides — or stab your virtual enemies — you might wind up slapping an innocent bystander in the face. Ideally, you want a private, controlled environment for virtual reality, so you can talk and move around freely and not have to worry about interruptions. This combination of a fixed location and processing power is what personal computing is all about. This is why I’m not surprised that Intel is investing in virtual environments, such as the work they’re doing for OpenSim with the Distributed Scene Graph and with BulletSim. If today’s chips are good enough for everybody, we need new killer apps that require more power. Other than virtual reality, I don’t see anything else on the horizon that requires more power than the computers we have now. So what will the new PCs look like? Probably very different than they do today. Or maybe just the same, except that when you turn them on, not only does the screen come to life, but also the entire room you’re sitting in. Either way, the operating system we have now won’t do. We’ll need an environment that’s about more than just documents. It will have to make it easy for us to enter our preferred virtual reality locations — our office, our virtual home for online social networks, our favorite games, our favorite learning environments or virtual tourism destinations. It will need to help us find virtual events of interest to us, connect us to our friends and colleagues, and serve as the basis for the exploration of the metaverse. In addition to allowing us to run apps and do our word processing. Windows 8 ain’t going to cut it.